Cherdo on the Flipside: Battle of the Bands: "Settle on a Slowdown"
Battle of the Bands: "Settle on a Slowdown"
Fire and brimstone coming down from the skies! Rivers and seas boiling! Forty years of darkness! Earthquakes! Volcanoes! The dead rising from the grave! Human sacrifice! Dogs and cats, living together! Mass hysteria! 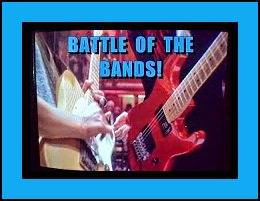 Ladies and gentlemen, this is THE BATTLE OF THE BANDS! I've cycling through the genres and buddy, it's time for a country tune (even a contemporary one!). One of the new guys of the last decade that I really appreciate is Dierks Bentley. He's easy on the eyes. Oh, and he sings! Yeah, that is what I meant to say. My favorite Dierks Bently song is "Settle for a Slowdown." That baritone voice...that guitar...the lyrics...the subtle hipster smack down...yep, that's it, it's a Bentley night. Let's make a little more interesting by doing a TRUE amateur edition! What will it be, my peeps? Slowhand Hunter Peebles or Greg "I Got Equipment" Stewart? I think both of these fellows have a good shot at it. Let's vote and I'll see you back here, GOD WILLING, on July 7! The battle is ON! Vocals were pretty similar--I wouldn't say that the microphone made all that much difference other than creating that microphone sound--and maybe Stewart's vocals were a tad better. However, Greg Stewart had more going with the guitar work and that's what sold me on his version. My vote goes to Greg Stewart. Even with no microphone I vote for Hunter. The microphone rounds out Greg's voice to much. That is all I am saying and I am sticking to it ! Ha ha, I'll take that vote! Loving the amateur battle. Much love to you, parsnip and thehamish. A VOTE FOR HUNTER! Thanks! I prefer Greg's voice over Hunter's because it seems to have a slight edge and a bluesy feel...somewhat. Greg is getting into to it, for real. Hunter seems really at home with the guitar; like it is part of him. Both have good vocals...wonder who will win? Thanks, Birgit! A VOTE FOR GREG! First... welcome back to BOTB! There's a quality of real sincerity in Greg's voice. I also thought that sincerity came across in his guitar playing. I see a future in music for that guy. 2. You're allowed to choose whomever you want for any reason at all, God bless America and freedom of hearing...er, speech. You already know this, but I usually choose performers who I like on one level or another. I DO like this song a lot, too. It's one of those that you imagine was actually inspired by true events...somebody hurt somebody somewhere. A VOTE FOR GREG! Thanks, Dogman! That's such a great monologue from Ghostbusters. Definitely Stewart's version. Less twangy. Twang is to country like rock is to roll, lol. Hard to separate the two, but I love this song. A VOTE FOR GREG! Thanks, Alex! Both are really good; but Hunter Peebles edged out by sincerity of vocals. Either could make a singing career. My thoughts, too, epT! There's more than one dude that can carry a tune in this battle, eh? Cherdo, Loved Amateur Night/Day on BoTB this round. I don't see either artist making out a career out of singing, but they were nice to listen to and did a good job on Dierks' song. There's something about the first contender that draws me to his cover, so I'm giving my vote to Hunter Peebles. Have a safe, funtastic 4th! Oooh, I'm behind! Thanks, Cathy - A VOTE FOR HUNTER! Very cool battle, Cherdo! And I love the amateur idea... Might just steal it one of these BoTBs :D (with credit, of course). After much deliberation, I'm voting for Greg... Both did a good (amateur) job, and maybe you're right on the microphone observation, but Greg's version just seemed easier to listen to. Steal away, my friend! Give it that Carribean pizzazz! Ha ha! Thanks, Guillie. Welcome back, Cherdo! Don't hold it against me, but I'm not a fan of Dierks Bentley. However I would like a little slowdown myself. Not holding it agin' ya, at all, Dixie! And I, too, would settle for a slowdown...but I wouldn't pass up a full stop. A VOTE FOR GREG! Thanks, Dixie! They were both pretty equal as singers and guitarists, but I liked Hunter's recording better, so I'm voting for him. It was sooo close! A VOTE FOR HUNTER! Thank, John! Not bad for amateurs. It's almost difficult to select who sings the best. After listening to both a couple times I decided I would place my vote with Greg Stewart. Greg is getting a following today! A VOTE FOR GREG! Thanks, Jeffrey! Greg gets my vote I like the 12-string and the mic helped! You have to love a 12 string. Everything sounds richer with 12. Hi dear Cherdo, I vote for Hunter, because even without the mic I really like his voice and think that he sings with his heart. :) I hope you are doing well, my cherished friend. Hugs to you. Darlin' Linda, I've fallen behind on visits but I will catch up. The big move happens this week and then things should settle down a bit. In the meanwhile, love and hugs to you! A VOTE FOR HUNTER! Thanks, Linda. Oh my - I do love me some Dierks. Fun fact: my husband went to college and was on drumline with Dierks drummer in his band. I think his name is Steve. My vote goes to Greg but nothing like the original! Dierks, oh Dierks, you do got it goin' on. I think he's a cutie patootie and I like his voice ("What Was I Thinking?" is another fav). A VOTE FOR GREG!! Thanks, Holli! I hope I'm not too late getting to the party. I love the idea of a True Amateurs contest! That's neat. Greg gets my vote. The mic really did help! Hunter Peebles was good and I really dig his name, but Greg Stewart just does a better job. BOTB Results: "Settle for a Slowdown"